Summer attendance proved thin at Art-a-Fair, though some artists still experienced strong sales. 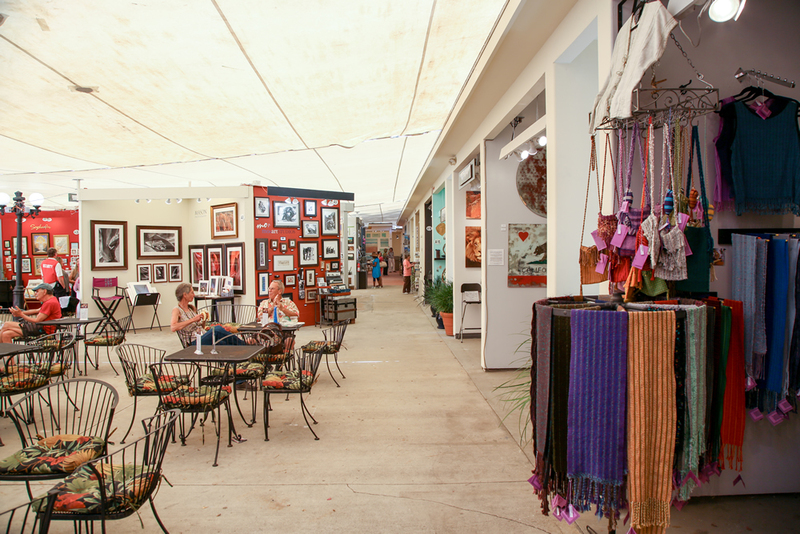 In taking stock of how artists fared at Laguna Beach’s top summer art festival destinations, it’s clear that the $10.5 million renovation of the Festival of Arts proved a boon, especially to new exhibitors. Exhibitor Jacques Garnier sold nearly all of his photographs and considers his first summer a major success, even if he lost a print to a sticky-fingered collector. “I did not know whether to laugh or be angry. I’m flattered, I guess,” he said. Even so, he considers it a true crowning achievement that his photograph titled “Lighter Than Air,” was purchased for the Festival’s permanent collection. It depicts one of the old hangars of the former Tustin Marine Air Base. With its stark lines set against a dark background, the piece is a standout among architectural photography, a genre increasingly popular among exhibitors of photography. Garnier is a seasoned pro who has participated in the recording of the transformation of the El Toro Marine Air Base and been included in at least 150 photography exhibitions. Photographer Mitch Ridder re-entered the Festival, after making his debut in 2010. “I’ve passed out 1,800 business cards, but sales fell slightly short this time,” he said. Still, said he felt good about being back this year. Lesli Bonanni, another first-timer, said she sold seven paintings. “This was my best year ever as an artist,” she said. More than 198,432 people attended the Festival, including ticket holders to the Pageant of the Masters, said spokeswoman Meghan Perez. Altogether 140 artists exhibited their work in booths, reorganized as a result of the remodel. Booth fees remained the same, $400 for members and $500 for non-members. Alas, second-year exhibitor Jeff Frisch did not fare as well. While his “Dream Vessels” sold well last year, his abstract “Hollywood Series,” garnered viewer interest but no sales. “There was a tremendous amount of interest, but no one took out their checkbook,” he said. Attendance at the Sawdust Festival was up by 10 percent, save for the last two weeks when school started for many, said spokeswoman Franky Duschane. Fewer booths dropped the the number of exhibitors to 196 from 203. “We changed our booth layout due to some tree removals and addition of new ones,” she explained. Booth fees started at $680 and will remain unchanged next year as well, she added. One big change: General Manager Tom Klingenmeier is retiring, handing the reigns to Natalie Haug. Printmaker Julita Jones can’t pin down when she joined the Sawdust Festival, where she finds the atmosphere friendly and more accepting. “Sales have not been as good as last year. I think it is the overall state of the country or state. People don’t seem to be in as much of a mood to buy,” she suggested. She is not sure whether she’ll exhibit next summer either. “I’ve been doing this too long. Perhaps we should give the younger ones a chance. We’ll see,” she said, her voice drifting off. Painter, photographer Douglas Miller sold 445 of his tiny canvases. “It was an average year. Last year I sold 530, which was exceptional,” he said. During visits to Art-A-Fair while the summer season was underway, visitors appeared sparse, though board president Michael Cahill said attendance was up. He declined to disclose specific figures. He said that sales were down compared to a year ago. Retired teacher Margaret Resnick had a different experience. With her booth filled with cute animal portraits, she enjoyed better sales this year than last even if attendance was slower. “I’ve been here seven years, it’s been up and down and, I’ve already committed for next year,” she said.